Definition at line 28 of file ModulesM68k.h. Definition at line 31 of file ModulesM68k.h. 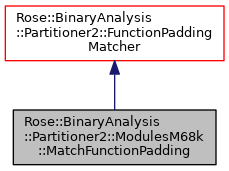 Attempts to match function padding that ends at the address immediately prior to anchor. If a match is successful then the return value is the starting address for the padding and must be less than anchor. When no match is found then anchor is returned. The size of the matched padding is always anchor-retval where retval is the returned value.